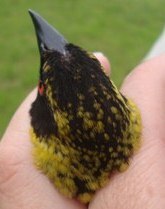 Mark Brown and his team of ringers caught an adult male Village Weaver with a partial black crown at their regular ringing at Darvill on 15 October. There was definitely no head moult. Mark and Dominic Rollinson didn't think there was enough enough black on the bird's head to make it subspecies Ploceus cucullatus nicriceps. 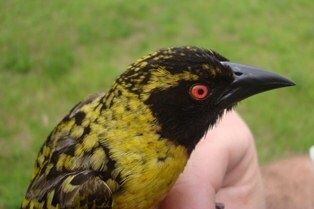 It could just be an aberrant bird - possibly some males carry genes for black on their heads. This suggests that other black-headed Village Weavers recorded in South Africa are unlikely to belong to P.c. nicriceps, but are aberrant P.c. spilonotus. 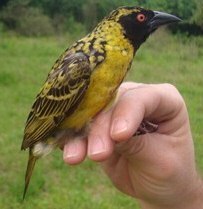 Please look out for more examples of the black-crowned race of Village Weaver in South Africa, and email me a photo with date and gps locality if you find one.